A DB security group controls access to EC2-Classic DB instances that are not in a VPC. A VPC security group controls access to DB instances and EC2 instances inside a VPC. An EC2 security group controls access to an EC2 instance. By default, network access is turned off to a DB instance. You can specify rules in a security group that allows access from an IP address range, port, or EC2 security group. Once ingress rules are configured, the same rules apply to all DB instances that are associated with that security group. You can specify up to 20 rules in a security group. DB security groups are used with DB instances that are not in a VPC and on the EC2-Classic platform. Each DB security group rule enables a specific source to access a DB instance that is associated with that DB security group. The source can be a range of addresses (for example, 203.0.113.0/24), or an EC2 security group. When you specify an EC2 security group as the source, you allow incoming traffic from all EC2 instances that use that EC2 security group. DB security group rules apply to inbound traffic only; outbound traffic is not currently permitted for DB instances. You don't need to specify a destination port number when you create DB security group rules. The port number defined for the DB instance is used as the destination port number for all rules defined for the DB security group. DB security groups can be created using the Amazon RDS API actions or the Amazon RDS page of the AWS Management Console. For more information about working with DB security groups, see Working with DB Security Groups (EC2-Classic Platform). Each VPC security group rule enables a specific source to access a DB instance in a VPC that is associated with that VPC security group. The source can be a range of addresses (for example, 203.0.113.0/24), or another VPC security group. By specifying a VPC security group as the source, you allow incoming traffic from all instances (typically application servers) that use the source VPC security group. VPC security groups can have rules that govern both inbound and outbound traffic, though the outbound traffic rules typically do not apply to DB instances. Outbound traffic rules only apply if the DB instance acts as a client. For example, outbound traffic rules apply to an Oracle DB instance with outbound database links. You must use the Amazon EC2 API or the Security Group option on the VPC Console to create VPC security groups. When you create rules for your VPC security group that allow access to the instances in your VPC, you must specify a port for each range of addresses that the rule allows access for. For example, if you want to enable SSH access to instances in the VPC, then you create a rule allowing access to TCP port 22 for the specified range of addresses. You can configure multiple VPC security groups that allow access to different ports for different instances in your VPC. For example, you can create a VPC security group that allows access to TCP port 80 for web servers in your VPC. You can then create another VPC security group that allows access to TCP port 3306 for RDS MySQL DB instances in your VPC. For more information on VPC security groups, see Security Groups in the Amazon Virtual Private Cloud User Guide. The following table shows the key differences between DB security groups and VPC security groups. Controls access to DB instances outside a VPC. Controls access to DB instances in VPC. Uses Amazon RDS API actions or the Amazon RDS page of the AWS Management Console to create and manage group and rules. Uses Amazon EC2 API actions or the Amazon VPC page of the AWS Management Console to create and manage group and rules. When you add a rule to a group, you don't need to specify port number or protocol. When you add a rule to a group, specify the protocol as TCP. In addition, specify the same port number that you used to create the DB instances (or options) that you plan to add as members to the group. Groups allow access from EC2 security groups in your AWS account or other accounts. Groups allow access from other VPC security groups in your VPC only. Create a VPC security group (for example, sg-appsrv1) and define inbound rules that use the IP addresses of the client application as the source. This security group allows your client application to connect to EC2 instances in a VPC that uses this security group. Create an EC2 instance for the application and add the EC2 instance to the VPC security group (sg-appsrv1) that you created in the previous step. The EC2 instance in the VPC shares the VPC security group with the DB instance. Create a second VPC security group (for example, sg-dbsrv1) and create a new rule by specifying the VPC security group that you created in step 1 (sg-appsrv1) as the source. Create a new DB instance and add the DB instance to the VPC security group (sg-dbsrv1) that you created in the previous step. When you create the instance, use the same port number as the one specified for the VPC security group (sg-dbsrv1) rule that you created in step 3. The following diagram shows this scenario. For more information about using a VPC, see Amazon Virtual Private Cloud (VPCs) and Amazon RDS. You can create a VPC security group for a DB instance by using the VPC console. 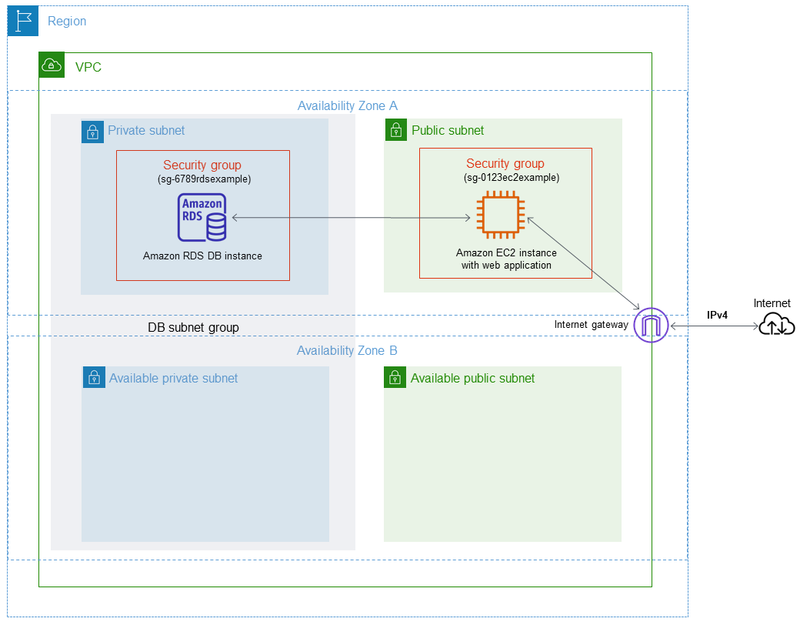 For information about creating a security group, see Provide Access to Your DB Instance in Your VPC by Creating a Security Group and Security Groups in the Amazon Virtual Private Cloud User Guide. You can associate a security group with a DB instance by using Modify on the RDS console, the ModifyDBInstance Amazon RDS API, or the modify-db-instance AWS CLI command. For information about modifying a DB instance, see Modifying an Amazon RDS DB Instance. For security group considerations when you restore a DB instance from a DB snapshot, see Security Group Considerations. DB VPC security groups are an RDS mechanism to synchronize security information with a VPC security group. However, this synchronization is no longer required, because RDS has been updated to use VPC security group information directly. DB VPC security groups are deprecated, and they are different from DB security groups, VPC security groups, and EC2 security groups. We strongly recommend that you delete any DB VPC security groups that you currently use. If you don't delete your DB VPC security groups, you might encounter unintended behaviors with your RDS DB instances, which can be as severe as losing access to a DB instance. The unintended behaviors are a result of an action such as an update to a DB instance, an option group, or similar. Such updates cause RDS to resynchronize the DB VPC security group with the VPC security group. This resynchronization can result in your security information being overwritten with incorrect and outdated security information. This result can have a severe impact on your access to your RDS DB instances. How Can I Determine If I Have a DB VPC Security Group? Because DB VPC security groups have been deprecated, they don't appear in the RDS console. However, you can call the describe-db-security-groups AWS CLI command or the DescribeDBSecurityGroups API action to determine if you have any DB VPC security groups. In this case, you can call the describe-db-security-groups AWS CLI command with JSON specified as the output format. If you do, you can identify DB VPC security groups by the VPC identifier on the second line of the output for the security group as shown in the following example. If you run the DescribeDBSecurityGroups API action, then you can identify DB VPC security groups using the <VpcId> response element as shown in the following example. How Do I Delete a DB VPC Security Group? Because DB VPC security groups don't appear in the RDS console, you must call the delete-db-security-group AWS CLI command or the DeleteDBSecurityGroup API action to delete a DB VPC security group. After you delete a DB VPC security group, your DB instances in your VPC continue to be secured by the VPC security group for that VPC. The DB VPC security group that was deleted was merely a copy of the VPC security group information. Older versions of AWS CloudFormation templates can contain instructions to create a DB VPC security group. Because DB VPC security groups are not yet fully deprecated, they can still be created. Make sure that any AWS CloudFormation templates that you use to provision a DB instance with security settings don't also create a DB VPC security group. Don't use AWS CloudFormation templates that create an RDS DBSecurityGroup with an EC2VpcId as shown in the following example. Instead, add security information for your RDS DB instances in a VPC using VPC security groups, as shown in the following example.